"Strap yourself in and take a 3-D ride on the wild side. 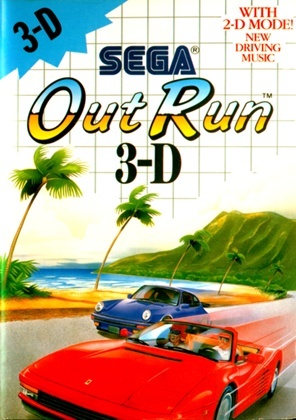 Sega's Out Run 3-Dtm is so close to reality it will leave you breathless! As your car whips around treacherous curves and over hills, you can almost feel the engine screaming and the wind whipping through your hair!" Cartridge donated by Philippe Dubois and dumped by Zoop. Press PAUSE to use 2-D mode.